Brittney Yevette Griner (born October 18, 1990) is an American professional basketball player who currently plays for the Phoenix Mercury in the Women's National Basketball Association (WNBA) and in Russia for UMMC Ekaterinburg. She played college basketball at Baylor University in Waco, Texas. She is the only NCAA basketball player to score 2,000 points and block 500 shots. In 2012, the three-time All-American was named the AP Player of the Year and the Most Outstanding Player of the Final Four. Standing 6 ft 8 in (2.03 m) tall, Griner wears a men's US size 17 shoe and has an arm span of 88 in (2.2 m). In 2009, Griner was named the nation's #1 high school women's basketball player by Rivals.com. Griner was selected to the 2009 McDonald's All-American basketball team. In 2012, she received the Best Female Athlete ESPY Award. Griner was recently on the USA Olympic Women's team, where she helped lead them to victory. In 2013, Griner signed an endorsement deal with Nike. Griner is the daughter of Sandra Griner. She has three older siblings. Griner attended Nimitz High School in Houston. In addition to lettering in basketball throughout high school, she played varsity volleyball as a freshman. Starting in her sophomore year, Griner practiced with the boys' basketball team, and worked with a Nimitz football coach to develop her leg strength in preparation for learning to dunk. During her junior season, a YouTube video featuring her dunks was watched more than 2.7 million times, leading to a meeting with Shaquille O'Neal. During her senior year, Griner led the Nimitz Cougars to the Texas 5A girls basketball state championship game, where Nimitz lost 52–43 to Mansfield Summit High School. Griner dunked 52 times in 32 games as a senior, setting a single-game record of seven dunks against Aldine High School. Houston mayor Bill White declared May 7, 2009, Brittney Griner Day. On November 11, 2008, she recorded 25 blocks in a game against Houston Alief Hastings, the most ever recorded by a female in a high school game in the US. In her 2008–09 season, she recorded 318 blocks, a single season record. Griner was named a WBCA All-American and participated in the 2009 WBCA High School All-America Game, leading the team by scoring 20 points and collecting 9 rebounds. Griner played college basketball at Baylor University in Waco, Texas. As a freshman, Griner's 223 blocked shots set the all-time single-season record, establishing her as one of the greatest shot blockers in women's basketball history. On December 16, 2009, Griner recorded Baylor's first triple-double with 34 points, 13 rebounds, and Big 12 Conference record 11 blocked shots. In January 2010, she became only the seventh player to dunk during a women's college basketball game, and only the second woman to dunk twice in a single college game, making the second and third dunks of her college career in a lopsided 99–18 victory against Texas State University. On March 3, 2010, Griner and Texas Tech player Jordan Barncastle were battling for position near the lane. As a foul was being called on Barncastle, Griner took two steps forward and threw a right-handed roundhouse punch which broke Barncastle's nose. Griner was then ejected from the game. Lady Bears coach Kim Mulkey then imposed another one-game suspension in addition to the one-game suspension mandated by NCAA rules. Baylor entered the NCAA Tournament as a 4th seed, and knocked off top-seeded Tennessee in the Sweet 16. On March 22, Griner set an NCAA tournament record with 14 blocked shots in a 49–33 win against the Georgetown Hoyas. In the Elite Eight, Baylor defeated Duke 51–48, and Griner blocked 9 shots, totaling 35 for the tournament, a new NCAA Women's Tournament record. Duke's Alison Bales had held the previous record of 30 blocks in the 2006 NCAA Women's Tournament. Baylor reached the Final Four, before losing to eventual-champion UConn, 70–50. Griner was named an AP Second Team All-American. As a sophomore, Griner received First Team All-American honors after averaging 23 points a game, including a career-high 40 points against Green Bay in the Sweet 16. In her junior season, Griner averaged 23.2 points, 9.4 rebounds and 5 blocks per game. She blocked more shots than any other Division I women's team that season. Griner was named AP Player of the Year  and The 2012 Premier Player of Women's College Basketball. On April 3, 2012, Griner led Baylor with 26 points, 13 rebounds and 5 blocked shots to win the Division I Women's Basketball Championship, 80–61 over Notre Dame. Griner was named the Final Four's Most Outstanding Player. Baylor finished its undefeated season with 40 wins, the most in NCAA history. After winning the championship on April 3, 2012, Griner decided to withdraw her candidacy for a roster spot on the 2012 U.S. Olympic women's basketball team. A month later Griner broke her wrist after jumping off her skateboard when she was going down a ramp. Her college career came to an end in the 2013 NCAA women's basketball tournament when Baylor lost to the University of Louisville Cardinals in the sweet 16. The only international players surpassing her height are the late Margo Dydek, at 7 feet 2 inches (2.18 m), the late Sue Geh, at 2.06 metres (6 ft 9 in) tall, Heidi Gillingham at 6 feet 10 inches (2.08 m) and Allyssa DeHaan at 6 feet 9 inches (2.06 m). In the 2013 WNBA Draft, the Phoenix Mercury selected Griner as the first overall pick. Griner would flourish in her rookie season, being named a WNBA all-star and would be a dominant defensive force in the league, averaging 3.0 blocks per game. 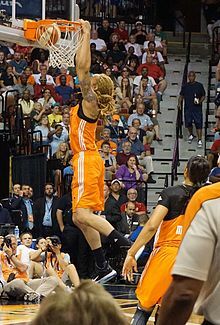 In her debut on May 27, 2013 against Chicago Sky, Griner equaled the WNBA dunk record, recording two dunks to equal Candace Parker's career total. She thus became the third WNBA player to dunk and first to do so twice in one game. Despite the All-Star vote, Griner missed the 2013 WNBA All-Star Game with a right knee injury, she was replaced by Tina Thompson. In the 2014 season, Griner's stats would improve, as she averaged 15.6 points per game, 8.0 rebounds per game and 3.7 blocks per game. On June 29, 2014, Griner had set a WNBA record with 11 blocks in a regular season game win against the Tulsa Shock, along with 21 points and 8 rebounds. On August 24, 2014, Griner became the first WNBA player to dunk in a playoff game when she helped the Mercury defeat the Los Angeles Sparks, 93–68, at Staples Center. The 2014 season would be a historic season for the Mercury with the combination of Brittney Griner, Diana Taurasi and Candice Dupree as the dominant Big 3 to carry the team plus the arrival of new head coach Sandy Brondello, the Mercury finished 29–5, setting the WNBA record for most wins in a regular season. They made it all the way to the WNBA finals and swept the Chicago Sky 3 games to 0, to capture the Mercury's third championship in franchise history. During the series, Griner set WNBA finals records in game 1 for most blocks in a game (8) and most blocks in a quarter (5). 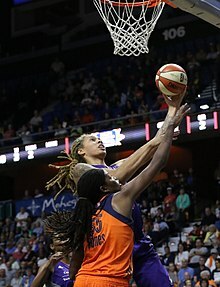 In the 2015 season, despite missing the first seven games due to a suspension stemming from her domestic violence case, Griner would have the most prolific defensive season in WNBA history, averaging a career high and WNBA record 4.0 blocks per game, surpassing Margo Dydek's record back in the 1998 season. Although the Mercury were playing without their all-star guard Diana Taurasi (who sat out the season to play overseas), the Mercury still made it to the playoffs. In the 2015 playoffs, Griner set a WNBA playoff record with 11 blocks (along with 18 points and 8 rebounds) in a game 1 victory against the Tulsa Shock, whom she also had 11 blocks against in a regular season game the year before. The Mercury would advance to the second round where they would get swept by the Minnesota Lynx who would win the championship that year. In the 2016 season, with the return of Diana Taurasi, the Mercury had a more successful playoff run. En route to the playoffs, Griner averaged 14.5 points per game, 6.5 rebounds per game and 3.1 blocks per game as the Mercury finished 16–18. During the season, Griner had recorded the sixth triple-double in WNBA history in a win against the Atlanta Dream where she had 27 points, 10 rebounds and 10 blocks. With the WNBA's new playoff format in effect, the Mercury were the number 8 seed in the league as they faced the Indiana Fever in the first round. The Mercury upset the Fever in the first round elimination game, as Griner had 18 points, 8 rebounds and 3 blocks. In the second round elimination game, the Mercury defeated the number 3 seeded New York Liberty, Griner had 22 points 10 rebounds and 4 blocks in the win. 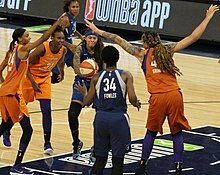 The Mercury advanced to the semifinals (the last round before the WNBA finals) against the championship defending Minnesota Lynx in a best-of-5 series but would get swept 3–0. On March 12, 2017, Griner re-signed with the Mercury to a multi-year deal once her rookie contract expired. In 2017, Griner would have the best season of her career thus far. On June 7, 2017, Griner scored a career-high 38 points along with 9 rebounds in a 98–90 overtime win against the Indiana Fever. Griner would miss 8 games of the season and the 2017 WNBA All-Star Game due to an ankle and knee injury (replaced by Rebekkah Brunson), but finished off the season leading the league in scoring with 21.9 points per game and also lead the league in blocks for the fifth consecutive season. The Mercury would finish with an 18–16 record as the number 5 seed. In the first round elimination game, the Mercury defeated the Seattle Storm 79–69, advancing to the second round. Griner scored 23 points along with 11 rebounds and 3 blocks in the win. In the second round elimination game, the Mercury defeated the Connecticut Sun 88–83 and advanced to the semi-finals. Griner scored 26 points along with 9 rebounds in the win. In the semi-finals, the Mercury were eliminated by the Los Angeles Sparks in a 3-game sweep. In 2018, Griner played all 34 games for the third time in her career. She was voted into the 2018 WNBA All-Star Game, making it her fifth all-star game appearance. On August 18, 2018, Griner scored a season-high 33 points along with 18 rebounds and 7 blocks in a 104–95 victory over the Atlanta Dream. This season was also her first season shooting from beyond the arc. Griner also led the league in blocks for the sixth consecutive year. The Mercury finished off the season 20–14 with the number 5 seed in the league. In the first round elimination game, the Mercury defeated the Dallas Wings 101–83. Griner scored 17 points in the win. In the second round elimination game, the Mercury defeated the Connecticut Sun 96–86, advancing to the semi-finals for the third year in a row, they would face off against the Seattle Storm. Down 2–0, the Mercury came back to tie up the series 2–2. In game 5, the Mercury lost 94–84, ending their season. In September 2011, Griner spent two weeks playing under coach Geno Auriemma for the U.S. National Team as part of its European training tour. Griner was the only college player in the group. She averaged 12.8 points and 7.3 rebounds a game with the USA team in Europe. Griner was the sole player still playing in college on the 2012 U.S. Olympic women's basketball team finalists roster. Excluding Griner, the average age on the finalists roster was approximately 30 years old compared to Griner, who was 22 years old at the time of the Olympics. Griner decided in April 2012 not to participate in the 2012 Olympics due to family illness and her school schedule. In April 2013, the Dallas Mavericks NBA franchise asked Griner to appear in tryouts for the team. In 2016, Griner played for the U.S. Olympic women's basketball team for the Summer Olympics and earned her first Olympic medal as they beat Spain 101–72 for the gold medal. In the 2013–14 off-season, Griner played in China for the Zhejiang Golden Bulls of the WCBA where she signed a 4-month contract for $600,000 which was 12 times the amount she made in her rookie season with the Mercury. In the 2014–15 and 2015–16 off-seasons, Griner played in Russia for UMMC Ekaterinburg with teammate Diana Taurasi, winning back-to-back championships. As of August 2016, Griner re-signed with UMMC Ekaterinburg for the 2016–17 off-season. In 2017, Griner re-signed once again with UMMC Ekaterinburg for the 2017–18 off-season. In 2018, Griner returned to UMMC Ekaterinburg for a fifth stint in the 2018-19 off-season. Along with being selected as the number one high school player in the country by Rivals.com, Griner was featured on the cover of ESPN's Rise magazine, and was selected by the Women's Basketball Coaches Association as the 2009 State Farm/WBCA High School Player of the Year. Griner also won the 2013 ESPY Award for best female college athlete. She was the 2012 winner of the Honda Sports Award for basketball and the overall Honda-Broderick Cup winner for all sports. She was the 2012 recipient of the Wade Trophy, presented to the best female NCAA Division I basketball player who embodies the "Spirit of Margaret Wade." She was the winner of the Ann Meyers Drysdale Award, in 2012, and again in 2013. The award is given by the U.S. Basketball Writers Association to the nation's top Division I women's player. Along with her other accolades, Griner is credited with bringing the women's game more attention due to her ability to dunk. She holds the NCAA record for dunks in a career with 18 total dunks. She passed Candace Parker as the all-time NCAA women's dunks leader. In 2014, Griner was included as part of the Advocate's annual "40 under 40" list. She was also named one of ESPNW's Impact 25 in 2014. In an interview with SI.com on April 17, 2013, Griner publicly came out as a lesbian. She also revealed in the interview that she was bullied as a child, explaining, "It's hard. Just being picked on for being different. Just being bigger, my sexuality, everything". She said she is very passionate about working with children in order to bring attention to the issue of bullying, particularly against LGBT people. While Griner is pushing the envelope when it comes to societal standards for women and the LGBT community, she does not view her story as particularly earth-shattering. As she puts it, "People tell me I'm going to break the barrier and trailblaze. I just kind of look at it like, I'm just trying to help out, I'm just trying to make it not as tough for the next generation." In 2013 Griner was featured on the cover of ESPN Magazine. She appeared in "The Taboo Issue". She is pictured holding a snake, which is her favorite animal because they are "misunderstood". She says, "You just have to look at it in a different way." Her endorsement deal with Nike was the first time the company had signed such a deal with an openly gay athlete. Griner continues to push back on traditional gender roles as she regularly models clothes branded as "menswear" for Nike. Nike spokesman Brian Strong said of signing Griner, "We can't get into specifics, but it's safe to say we jumped at the opportunity to work with her because she breaks the mold." Griner had previously come out to her parents in high school, which her father did not accept gracefully, forcing her to live with an assistant coach for six weeks during her senior year. She would later write a memoir with Sue Hovey addressing bullying and self-acceptance, In My Skin: My Life On and Off the Basketball Court, published in 2014. On August 14, 2014, Griner announced her engagement to fellow WNBA player Glory Johnson. However, the couple were arrested on charges of assault and disorderly conduct on April 22, 2015, eight months after their engagement, after police broke up a fight between the two in their Goodyear, Arizona home. Both had sustained minor injuries. They were married on May 8, 2015 in Phoenix, Arizona. On May 15, 2015, the WNBA suspended Griner and Johnson for seven games each after Griner pled guilty to disorderly conduct charges. Griner was also required to complete 26 weeks of domestic violence counseling. On June 4, 2015 Griner and Johnson announced that Johnson was pregnant with twins. The following day, Griner filed for an annulment of the marriage citing fraud and duress. Griner has no biological connection to the twins. It had been revealed that Johnson had become pregnant through IVF treatment using her eggs and a sperm donation. The divorce was finalized in June 2016. ^ "Houston rocket: Nimitz 6–6 sophomore "Brittney Griner is taking off", SI.com, January 16, 2007. ^ Brittney Griner. "Baylor Women's Basketball Player Bio". Baylorbears.com. Retrieved April 29, 2013. ^ Longman, Jeré (March 19, 2013). "Brittney Griner's Final Season Draws Applause and Crowds". The New York Times. ^ a b Jeff Fedotin, Griner named nation's no. 1 player Archived March 4, 2009, at the Wayback Machine, Yahoo Sports. Retrieved April 19, 2013. ^ "Could 6'8" Brittney Griner play in the NBA? ", Yahoo! Sports, February 12, 2008. ^ "McDonald's Girls All-American Teams Announced". Maxpreps.com. Retrieved April 29, 2013. ^ "Brittney Griner". USA Basketball. April 24, 2017. Retrieved June 16, 2017. ^ Nelson, Glenn (June 24, 2008). "Greatness and Griner go hand in hand". ESPNHS HoopGurlz. ESPN. Retrieved June 16, 2017. ^ a b Campbell, Steve (January 12, 2009). "Basketball prodigy's tall tale is no myth". Houston Chronicle. Retrieved June 16, 2017. ^ McLaughlin, Elliot L. (April 4, 2012). "Baylor star center Brittney Griner leads team to 40–0 season, championship". CNN. Retrieved June 16, 2017. ^ "High School Sports Record Book". National Federation of State High School Associations. Retrieved July 1, 2012. ^ "Brittney Griner Profile". Baylorbears.com. Retrieved July 28, 2015. ^ "Brittney Griner has triple-double, misses 3 dunks". Interbasket.net. December 17, 2009. Retrieved April 29, 2013. ^ "Griner Dunks Twice in WBB's 99–18 Win". Baylorbears.com. January 2, 2010. Retrieved April 3, 2010. ^ "Video: Brittney Griner dunks twice, Baylor wins by 81". Interbasket.net. Retrieved July 28, 2015. ^ "Griner punches Barncastle after foul", ESPN.com, March 4, 2010. ^ "Baylor Freshman Suspended for Punching Opponent in the Face", AP in The New York Times, March 4, 2010. ^ "Georgetown Hoyas vs. Baylor Lady Bears – Recap". ESPN. March 22, 2010. Retrieved April 3, 2010. ^ "Griner sets NCAA tournament mark for blocked shots". Rivals.yahoo.com. March 30, 2010. Retrieved April 3, 2010. ^ "Brittney Griner – WNBA Draft". October 14, 2012. Retrieved October 11, 2012. ^ a b "Baylor University Sports Information". Baylorbears.com. Retrieved April 29, 2013. ^ Hays, Graham (December 5, 2012). "Comfort Zone". espnW. Retrieved December 5, 2012. ^ "Baylor Bears' Brittney Griner is AP Player of the Year". Espn.go.com. January 4, 2012. Retrieved July 28, 2015. ^ John Altavilla, Herald-Mail Archived April 7, 2012, at Archive.today Baylor women top Notre Dame to complete 40–0 season, April 3, 2012. ^ a b "Griner focused on senior season with champ Baylor". Usatoday.com. October 15, 2012. Retrieved March 24, 2013. ^ Game's biggest upset stuns Baylor ESPN. March 31, 2013. ^ "WNBA – Elena Delle Donne, Chicago Sky knock off Brittney Griner, Phoenix Mercury – ESPN". Espn.go.com. May 28, 2013. Retrieved December 4, 2013. ^ "Slow Start, Long Season". Wnba.com. Retrieved December 4, 2013. ^ "Watch Brittney Griner slam down the first dunk in WNBA playoff history". USA Today. ^ Hersh, Philip (September 12, 2014). "Diana Taurasi and Mercury sweep to WNBA title over Sky". The Chicago Tribune. Retrieved September 13, 2014. ^ "Griner signs new multiyear deal with Mercury". ESPN.com. Retrieved March 14, 2017. ^ ESPN broadcast of UConn v. Baylor, originally aired December 18, 2011. ^ "2012 U.S. Olympic Women's Basketball Team Roster". USA Basketball. April 23, 2012. Retrieved March 24, 2013. ^ "Brittney Griner NBA Tryout? Baylor Star Open To Mavericks Owner's Offer". M.huffpost.com. April 6, 2013. Retrieved April 11, 2014. ^ Unlikely comrades Diana Taurasi and Brittney Griner play overseas for the money. As it turns out, they also simplify their lives. ^ a b Yolande Lezine, Another Honor For Brittney, February 17, 2009. Retrieved 03-02-3009. ^ "USBWA WOMEN'S HONORS". Retrieved February 18, 2015. ^ "Brittney Griner AAU Biography" (PDF). AAU Sports. ^ "Brittney Griner - Women's Basketball". Baylor University Athletics. Retrieved March 7, 2019. ^ "Griner sets NCAA women's mark with 8th dunk". ESPN.com. November 18, 2012. Retrieved March 7, 2019. ^ "Past WBCA HS Coaches' All-America Teams". Women's Basketball Coaches Association. Archived from the original on July 15, 2014. Retrieved July 1, 2014. ^ a b c "WBCA NCAA Division I Defensive Player of the Year". Women's Basketball Coaches Association. Retrieved July 1, 2014. ^ "Moore named MVP of 2014 FIBA World Championship for Women, headlines All-Star Five". FIBA.com. Retrieved October 5, 2014. ^ "40 Under 40: Brittney Griner Wants Our Kids to Feel Hope". Advocate.com. Retrieved December 18, 2014. ^ "2014 espnW Impact 25". espnW. Retrieved December 18, 2014. ^ Feinberg, Doug (April 18, 2013). "Griner, Delle Donne and Diggins dealt with bullies". SI.com. Retrieved April 18, 2013. ^ "WNBA's Brittney Griner on Being a Gay Athlete: I Felt Like Half of Me Wasn't Accepted". PEOPLE.com. Retrieved March 8, 2019. ^ ESPN. ESPN Magazine (June 10, 2013) Taboo Issue - Britney Griner. ^ "Owning The Middle". ESPN.com. Retrieved March 8, 2019. ^ Longman, Jeré (May 30, 2014). "Life Out Loud: 'In My Skin,' by Brittney Griner". The New York Times. Retrieved June 16, 2017. ^ a b Galehouse, Maggie (April 4, 2014). "Brittney Griner: independent at last". Houston Chronicle. Retrieved June 16, 2017. ^ Griner, Brittney; Hovey, Sue (April 8, 2014). In My Skin: My Life On and Off the Basketball Court. Dey Street Books (HarperCollins). ISBN 9780062309341. Retrieved June 16, 2017. ^ Nichols, James (August 15, 2014). "Brittney Griner Proposes To Girlfriend Glory Johnson". Huffington Post. Retrieved August 15, 2014. ^ Silver, Jake (August 15, 2014). "WNBA's Brittney Griner Gets Engaged to Former Tennessee Vols Star Glory Johnson". Bleacher Report. Retrieved August 15, 2014. ^ "WNBA star Brittney Griner arrested on assault and disorderly conduct". Sports Illustrated. April 23, 2015. Retrieved April 23, 2015. ^ "Mercury's Brittney Griner arrested on assault allegations". Azcentral.com. April 23, 2015. Retrieved July 28, 2015. ^ "Former Lady Vol Glory Johnson, WNBA Star Brittney Griner wed on Phoenix mountaintop". Archived from the original on May 12, 2015. Retrieved May 9, 2015. ^ "WNBA Wedding! Brittney Griner Marries Glory Johnson". Us Weekly. Retrieved March 10, 2017. ^ Mather, Victor (May 15, 2015). "Brittney Griner and Glory Johnson Suspended 7 Games in Domestic Violence Case". The New York Times. Retrieved May 15, 2015. ^ a b azcentral sports staff (June 6, 2015). "Report: Mercury's Brittney Griner files for annulment". azcentral. The Arizona Republic. Retrieved June 6, 2015.